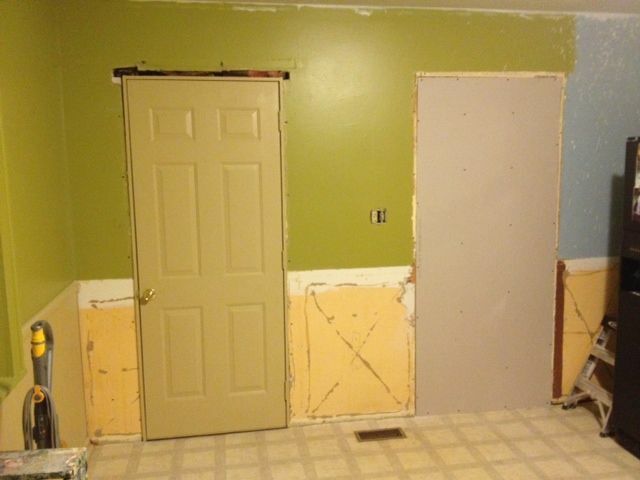 Today I would like to share the renovations my parents (Annie’s parents) have made to their “new” place. I say “new” because it was actually my sister and her family’s house until fall of 2012 when they switched houses. 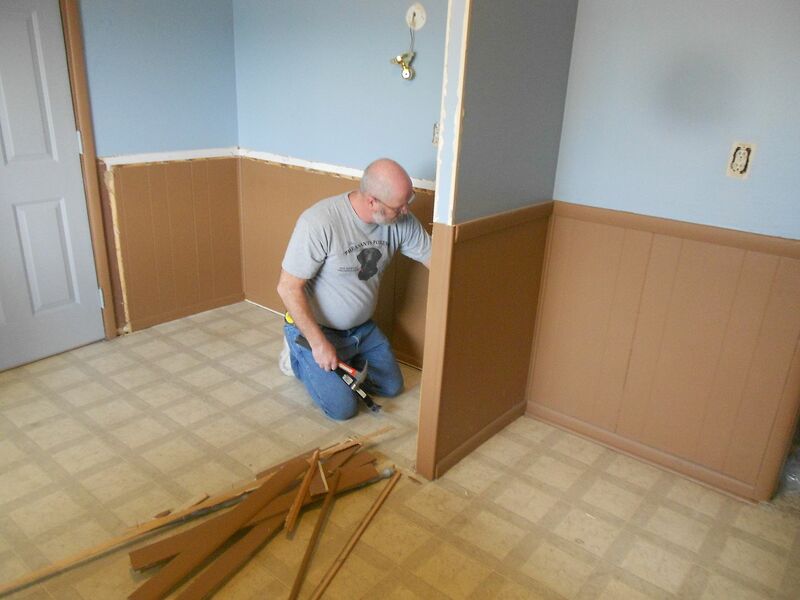 My youngest sis and her family moved into my parent’s (they bought and did the entire legit change of course) country house in my hometown in Indiana and my parents and other sister moved a town over (where we went to middle and high school), began a new chapter in their lives and performed a makeover on the space. A big one. They too went from country to town living and understand what Greg and I have experienced. It truly is a change in itself not to mention undergoing renovations from the start. 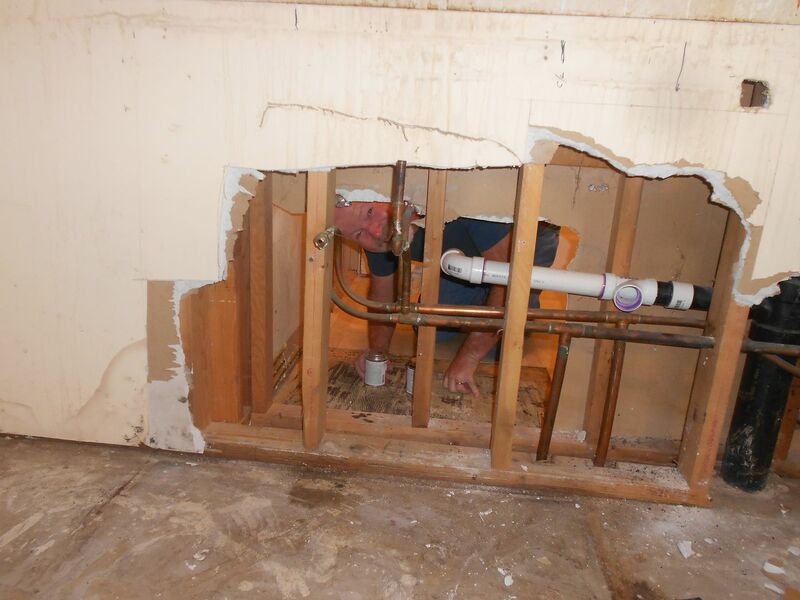 We’ve been doing the DIY house reno thing together though…although theirs was at a much faster pace than ours. It was nice being able to talk about the same things and mishaps/successes 600 miles apart. 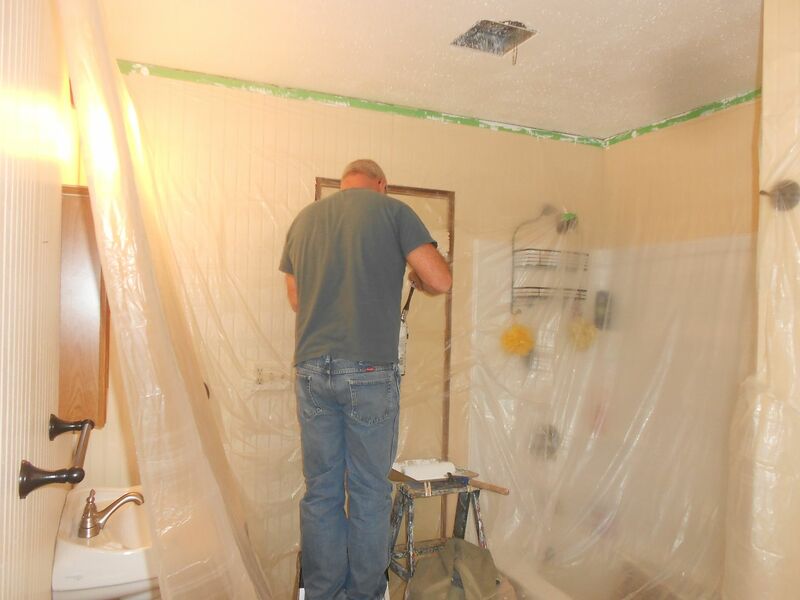 There were some mishaps, delays and the usual issues with a remodel (questioning the paint color and living in a hectic situation). The cabinet dropped on on my mom’s big toe and I won’t share the picture but ouch and dad had some boo boos too. 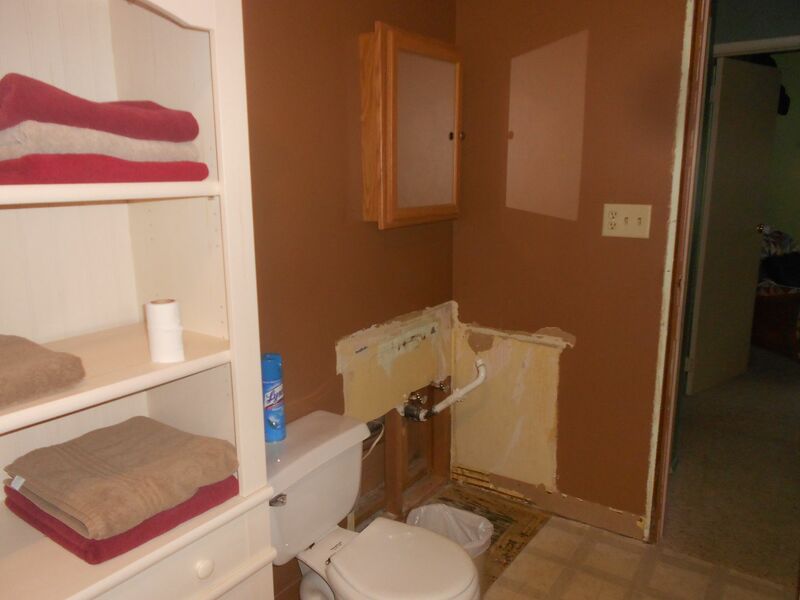 Unfortunately, there aren’t really much in terms of before pics. I’ll try to explain what it used to look like though. 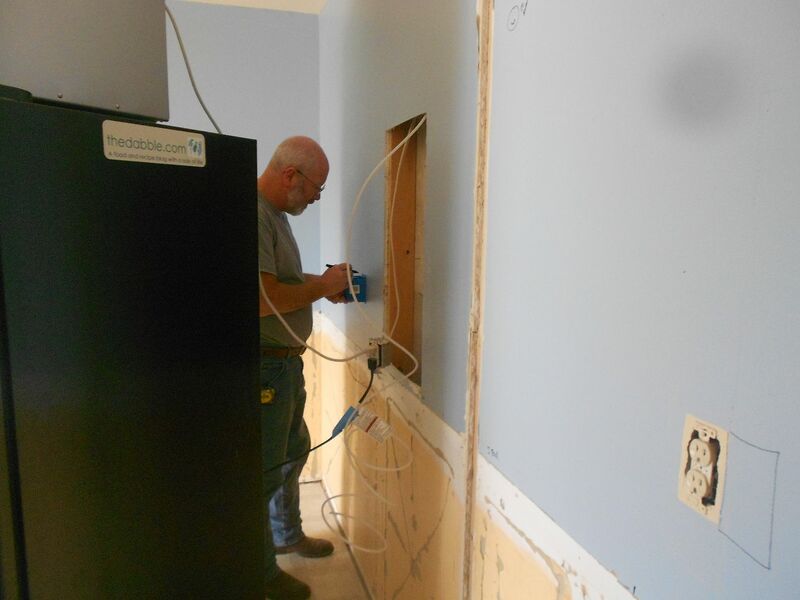 It’s an amazing transformation and they continue to work on the house, making vast improvements. A mudroom is in their future. By the way we have not seen the house in person so I’m explaining as best I can from memory and talking with my parents. I still can’t get over how different and wonderful it looks. Huge improvement! It was small, people, and lacking storage and really a sense of style. It just kind of existed and did the basic functions. No offense to my sister who tried to add a touch of something. She did have 2 great kids who started their lives in this house and did a fabulous job on their rooms and touches of her own on the rest of the house. New storage cabinet (and the room was brown). 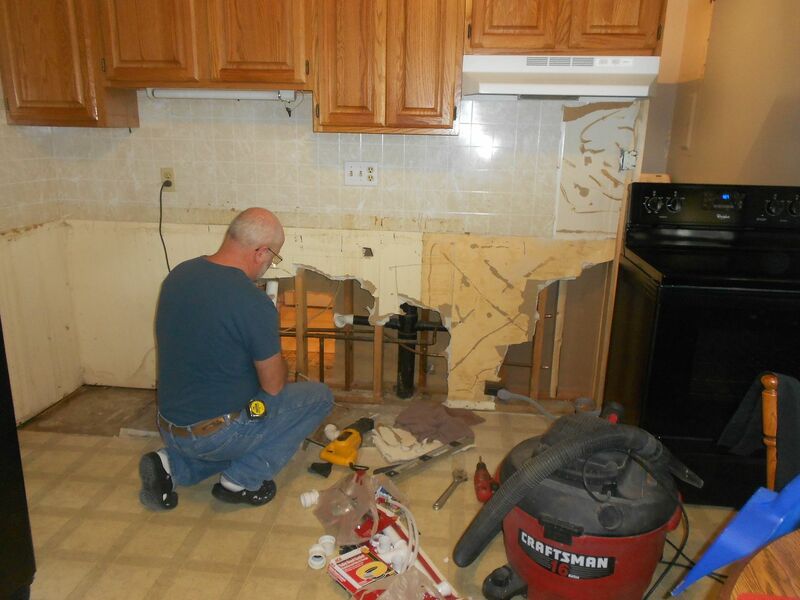 The wall was removed that had a second entry door from the laundry room which was open to the kitchen. This new layout really opened up the space. 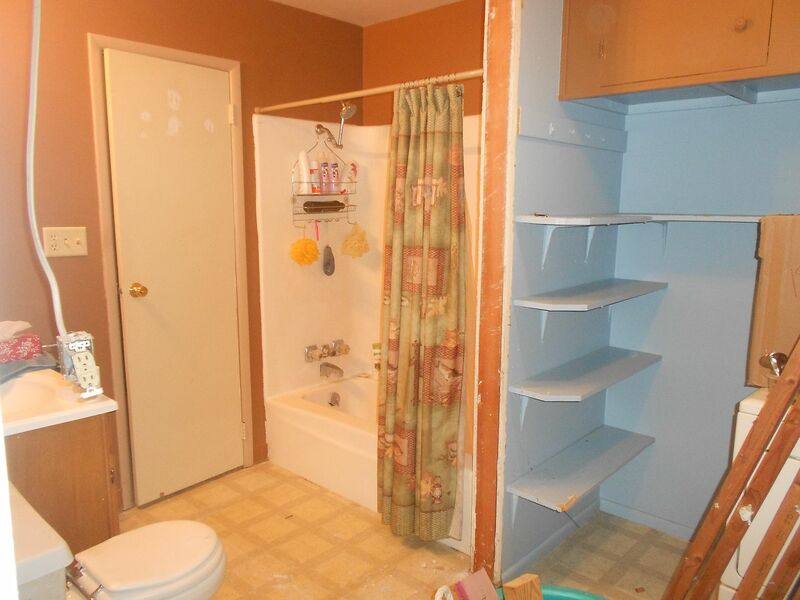 The bathroom and kitchen share a wall which is the one the toilet and cabinet are against. 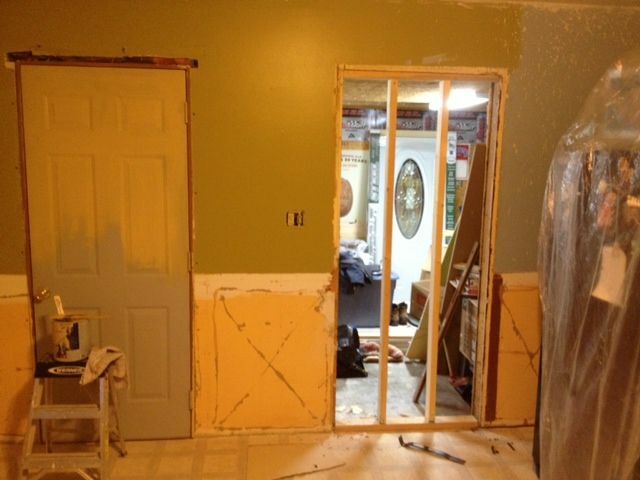 This is when the new doorway and wall were built (the back and side of the cabinet). 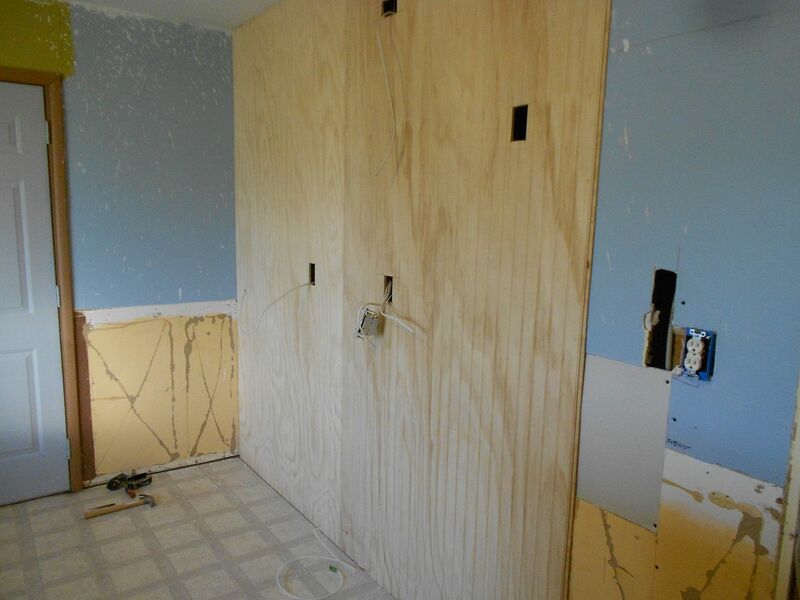 See, shared wall for plumbing (the house is on a slab) between the bathroom and kitchen. How adorable is my dad? 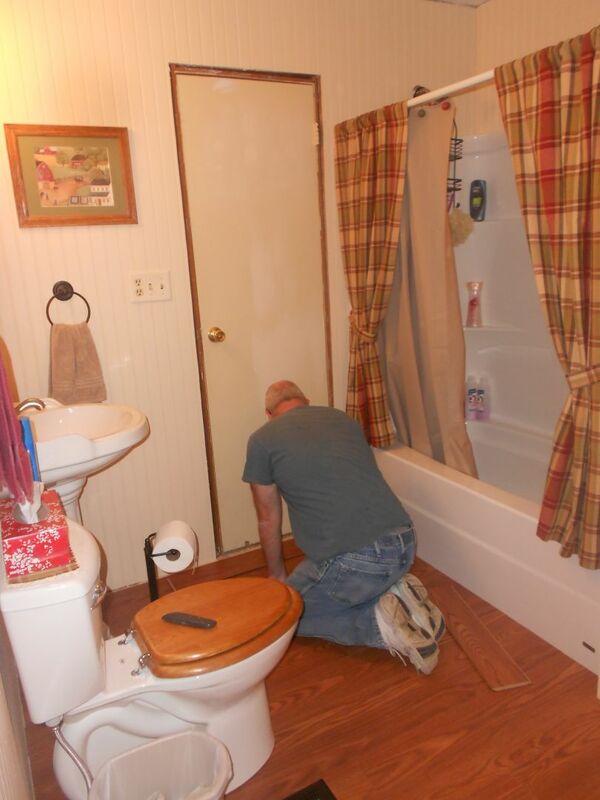 I’m going to mention they also got one of those new tankless water heaters and my dad is in heaven. Hot water whenever you want and it doesn’t run out unlike their old place. 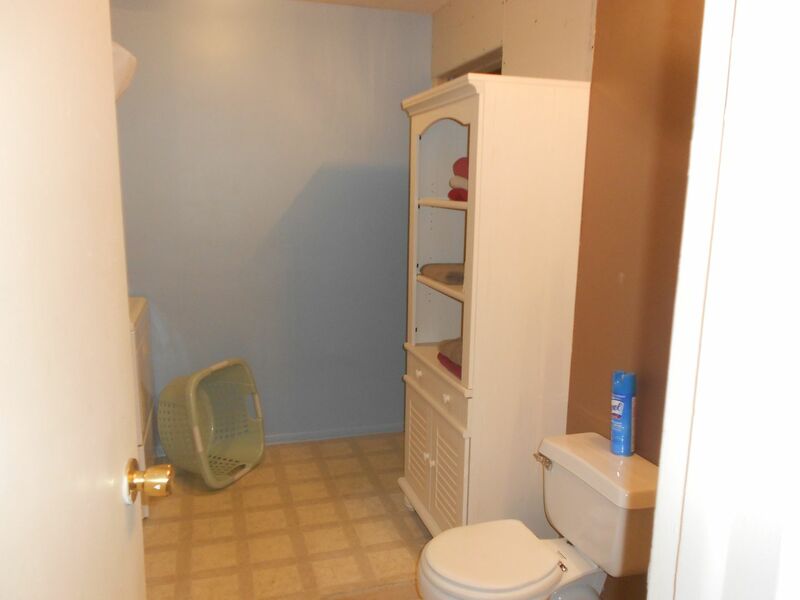 (Growing up, the 3 of us girls and my parents had tifts over the bathroom and I remember some of us had to wait til we had hot water again…often that was dad if I remember correctly.) We’re considering getting one. 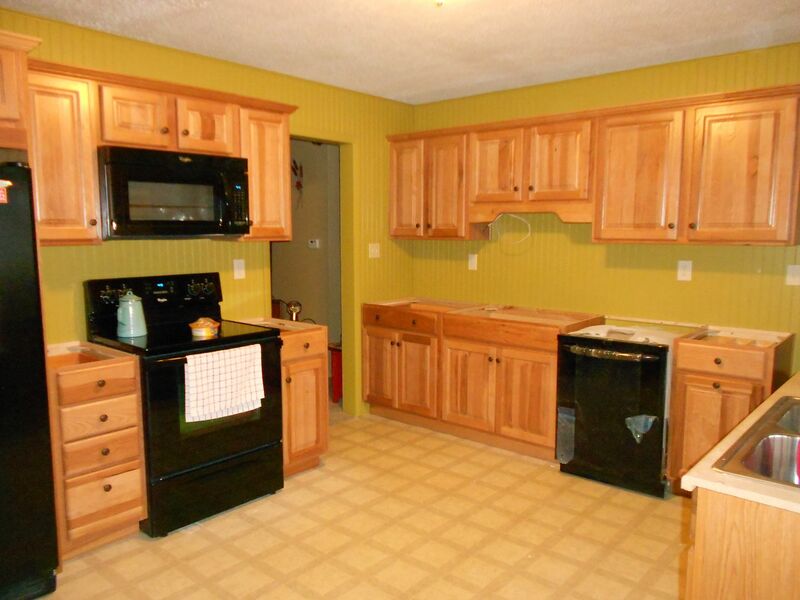 New shower, sink, hardware, fixtures, beadboard, doors, paint and more. 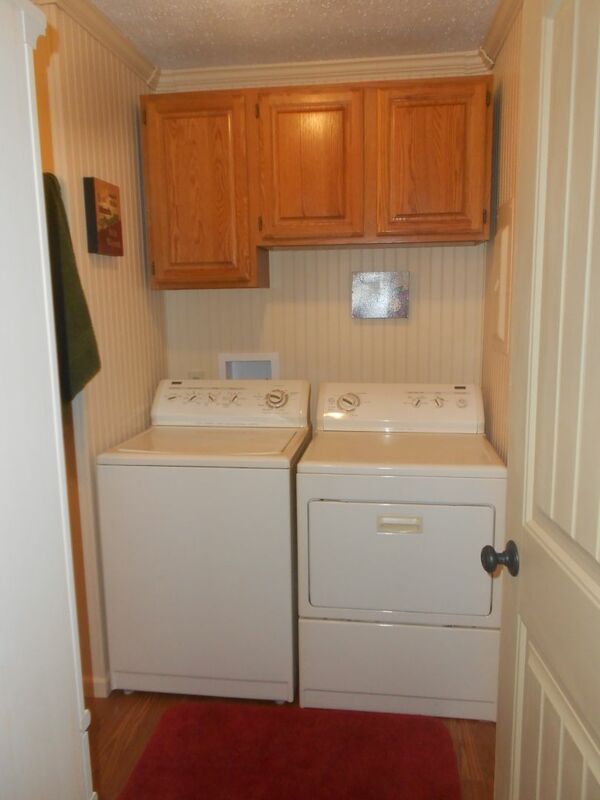 The cabinets were re-used and placed in the laundry area. 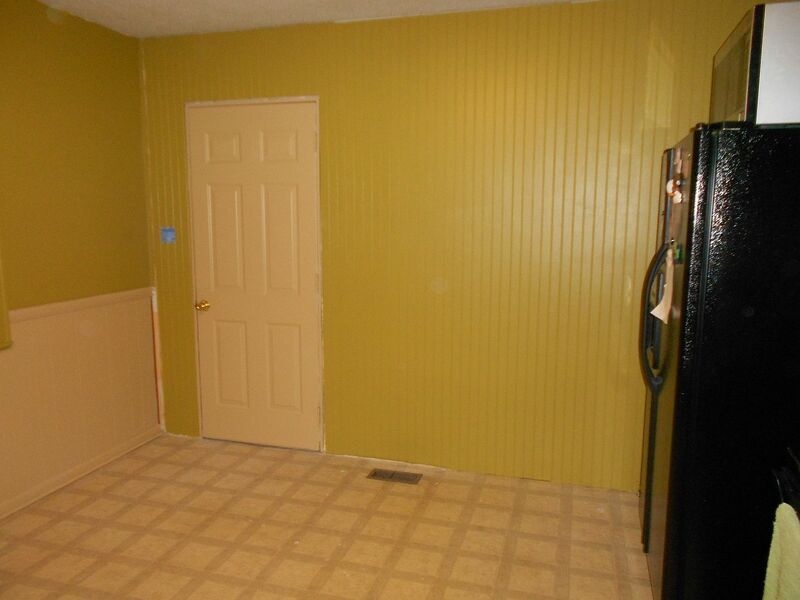 Forgive me but I couldn’t find a full picture of the finished room but you can see the big change and how beautiful it now is. But that’s not all…they went to the kitchen next. Which needed help. A lot of help. The layout was not decent and while it was rather large, it didn’t have much storage or flow. My parents set out to fix all of this, living with all that randomness of temporary shelving and not having a stove for a bit. And there was this thing. Some divider that served no purpose whatsoever. 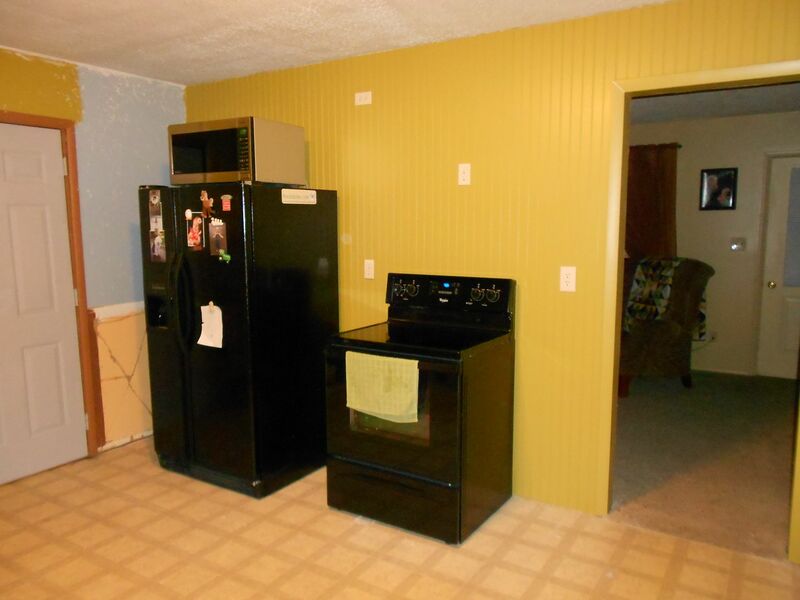 I know, let’s block the kitchen from the kitchen. Random. 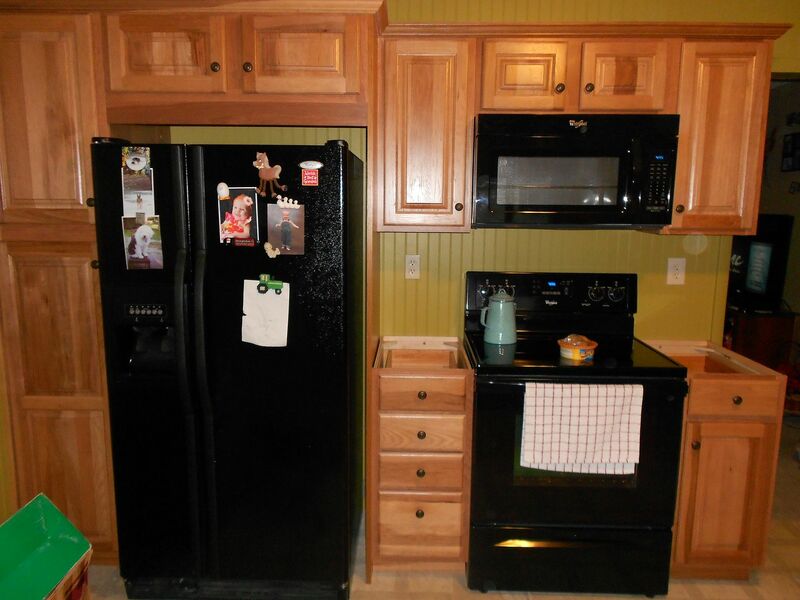 The refrigerator used to be on the right side and my sis had a pantry cabinet (had to have it with the lack of cabinet space) with the microwave in it. 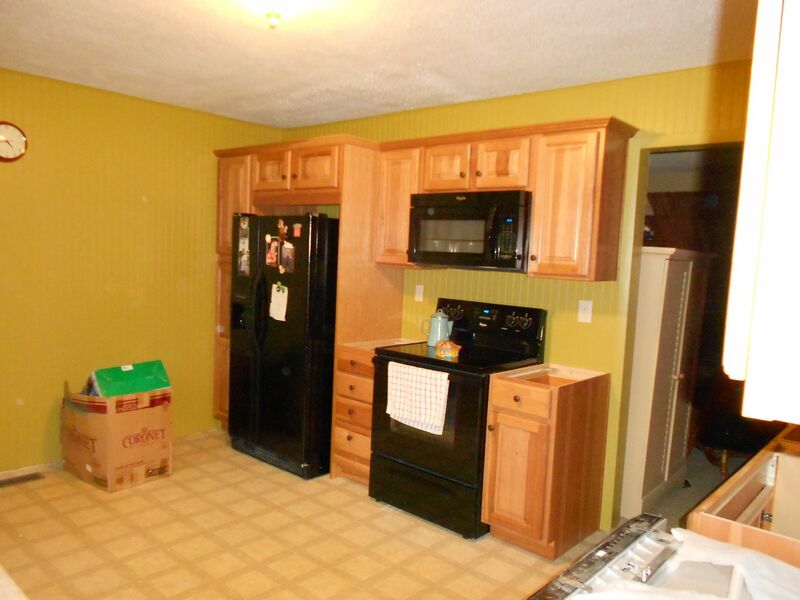 Since it’s an eat-in kitchen, it was even harder to move around in and not really accommodating for an island with the old arrangement which would have helped with the lacking counterspace. My magnet for my food blog! Shameless plug? I think not. 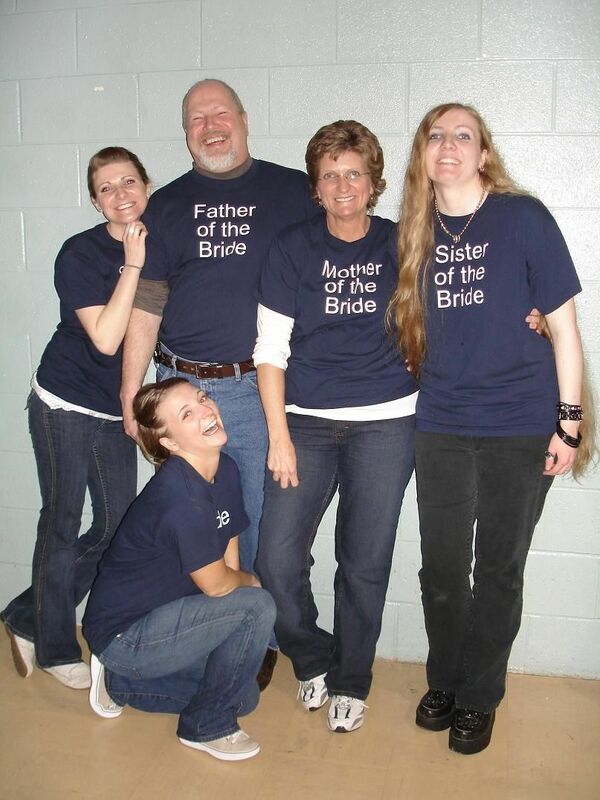 Supportive parents. Same space. Wall shared with the living room. Earlier in both renos (these are not in order). 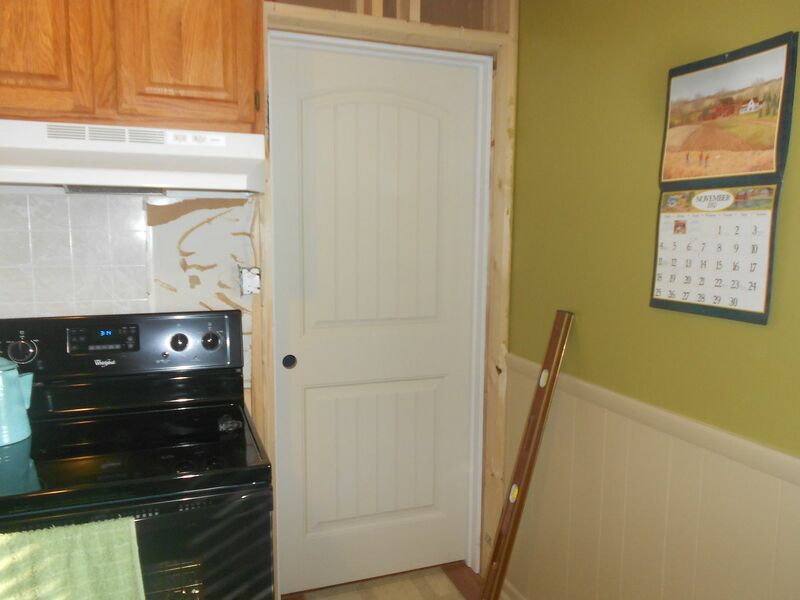 The door to the garage was removed and a new one was made on the left. Much better. Great vacuum by the way. We have one too. Craigslist score for like $60 but only after we really liked my parent’s Dyson and kept an eye out. 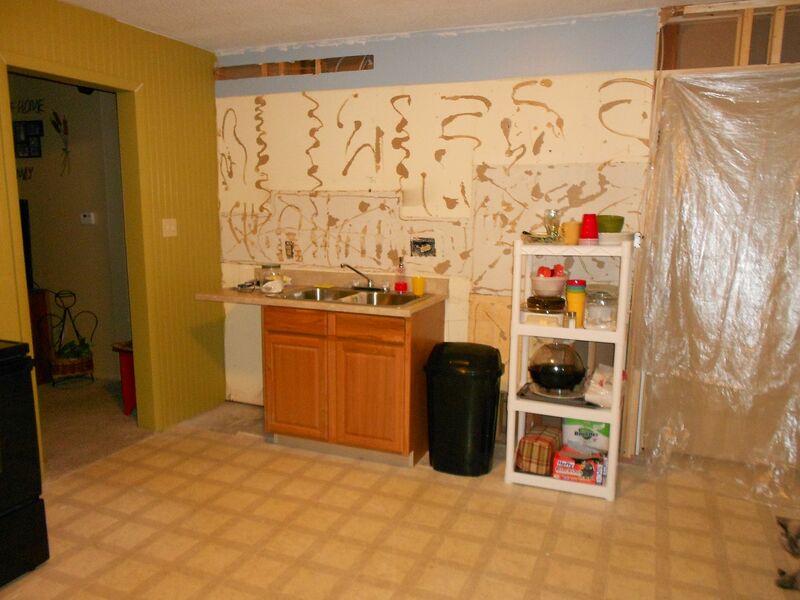 Oh the joy of living through a reno! 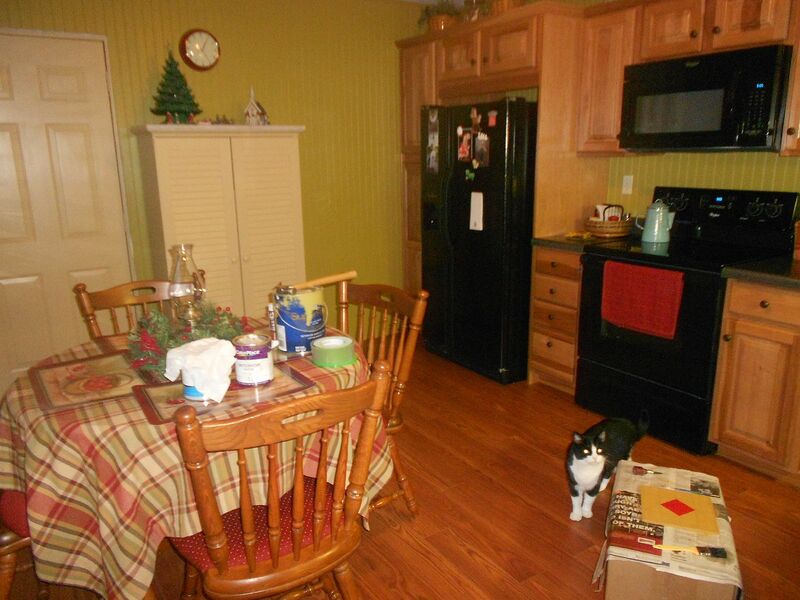 Sneakity peek into the living room from the kitchen entry. 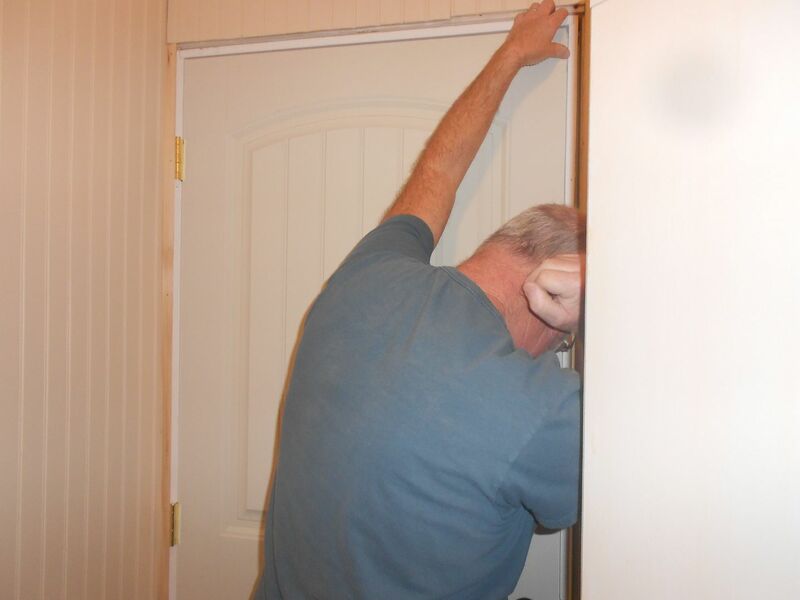 Forgot to show you the new door to the bathroom. 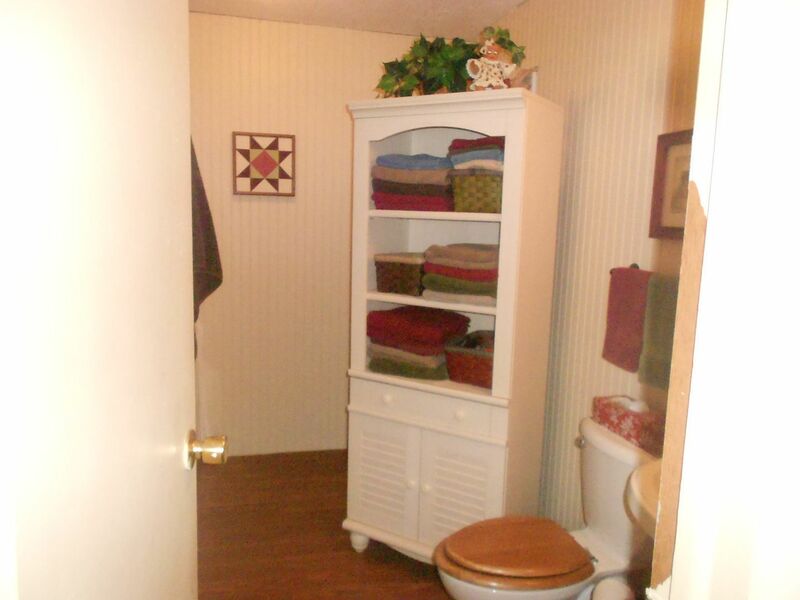 So, there are 2 entries to the bathroom. 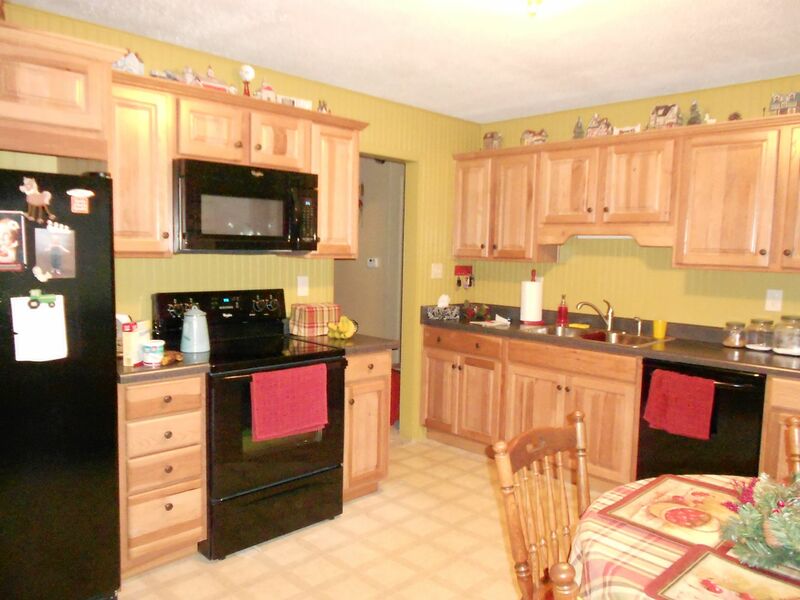 The one in the hall that leads to the 3 bedrooms and this one in the kitchen. 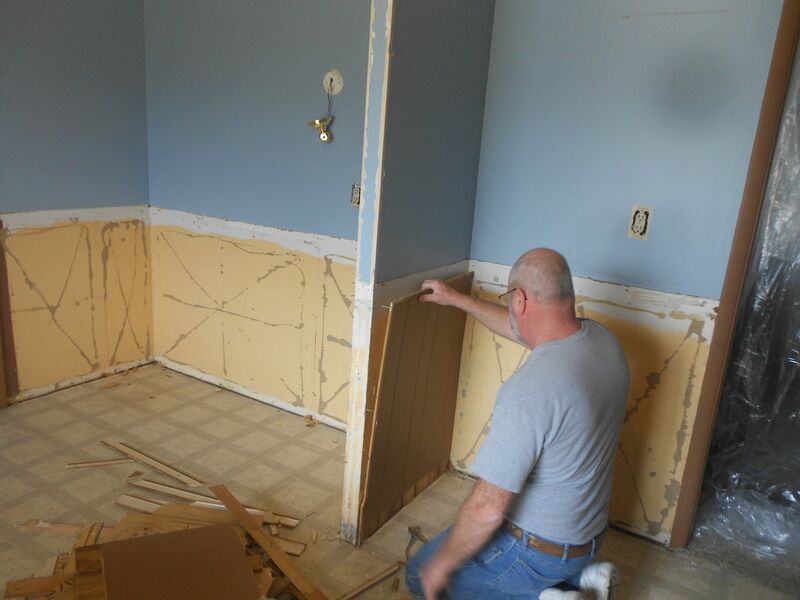 Waiting for the countertop. 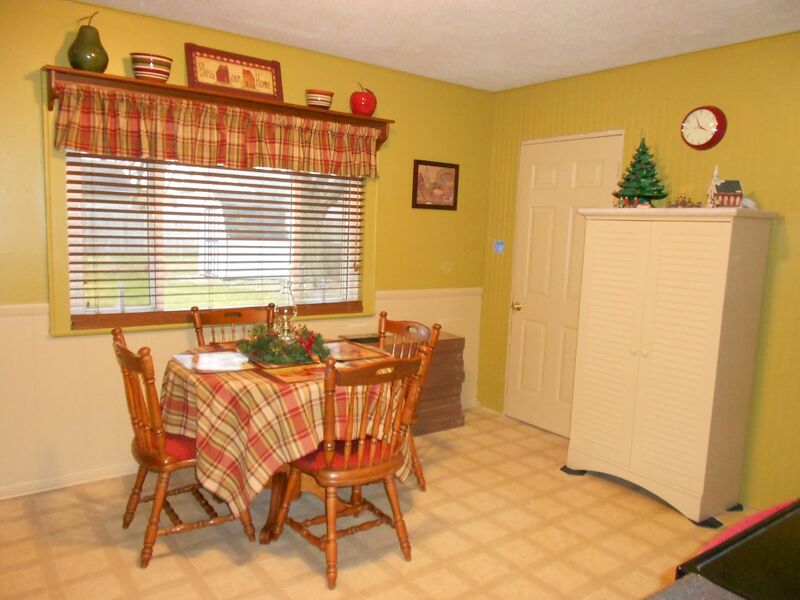 Hickory cabinetry and that is a greenish yellow shade on the wall that mom questioned but I think goes well with the overall look. Lovely. And talk about storage and flow. Mom loves it. Before the new flooring went in. 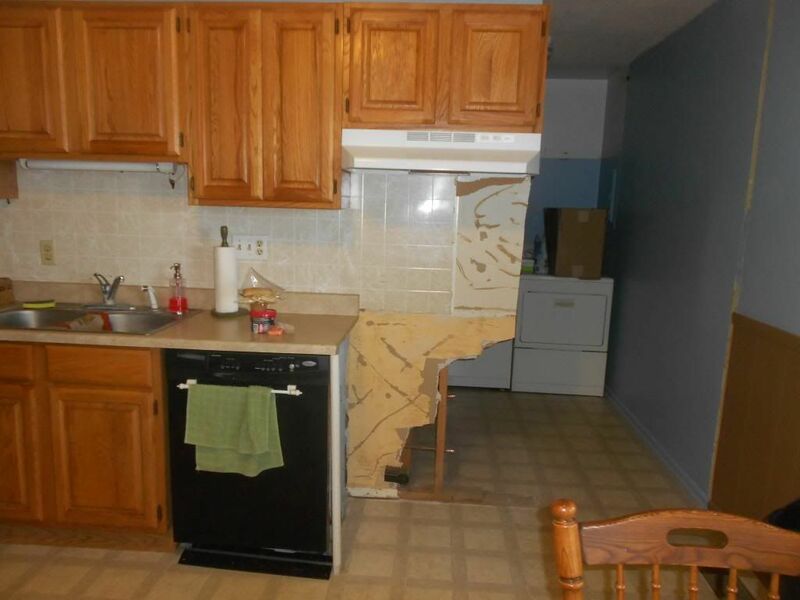 And there is no sink on the right-it was just moved there temporarily. That’s where the large window overlooking the backyard and dining set is. 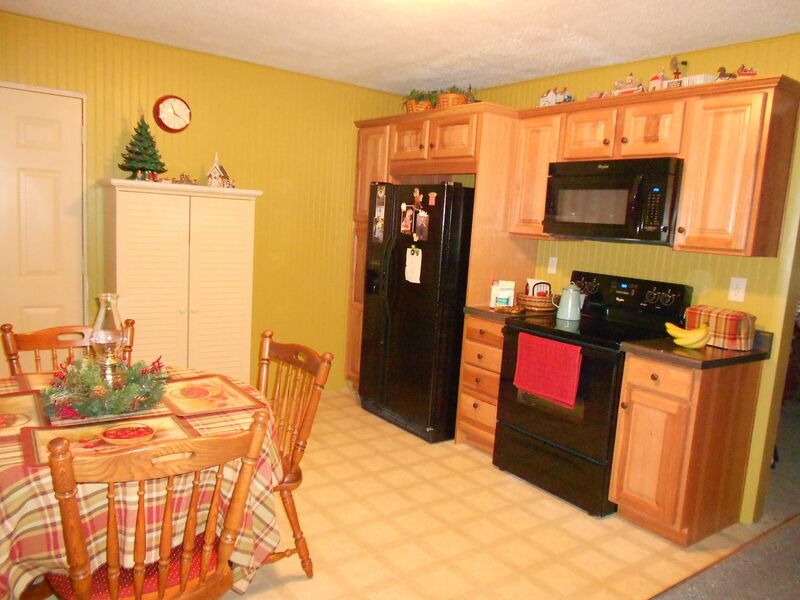 Dressed for Christmas with the village and with countertops. 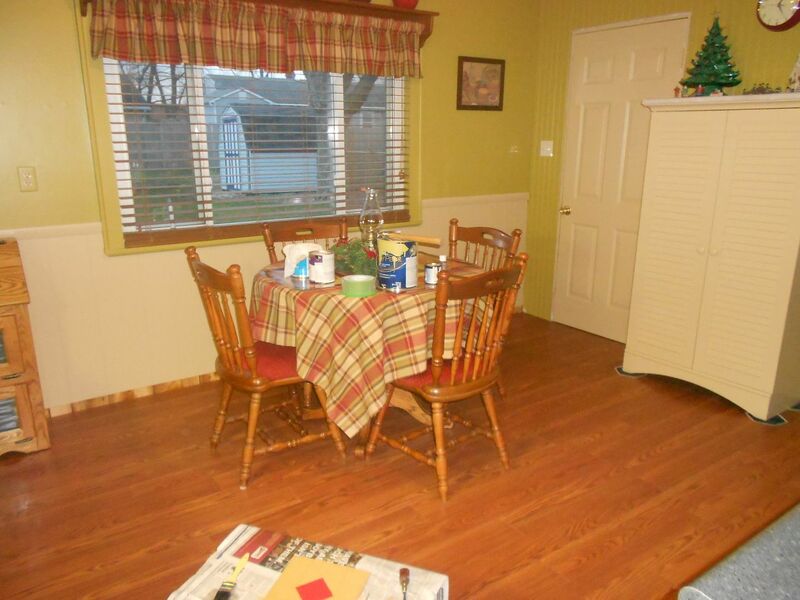 The dining set was a thrifty furniture store score cause that’s how our family rolls. Boom! I spy the new flooring boxes. Then ta-da, flooring added. Lucky, our family cat, and a box with a craft project atop it. We’re crafty, DIY kind of people that love animals. Lucky was a stray that my mom found on the road by our house. He’s an ornery sweetheart. I bet Sophie, our other family cat, was nearby. Another rescue darling. 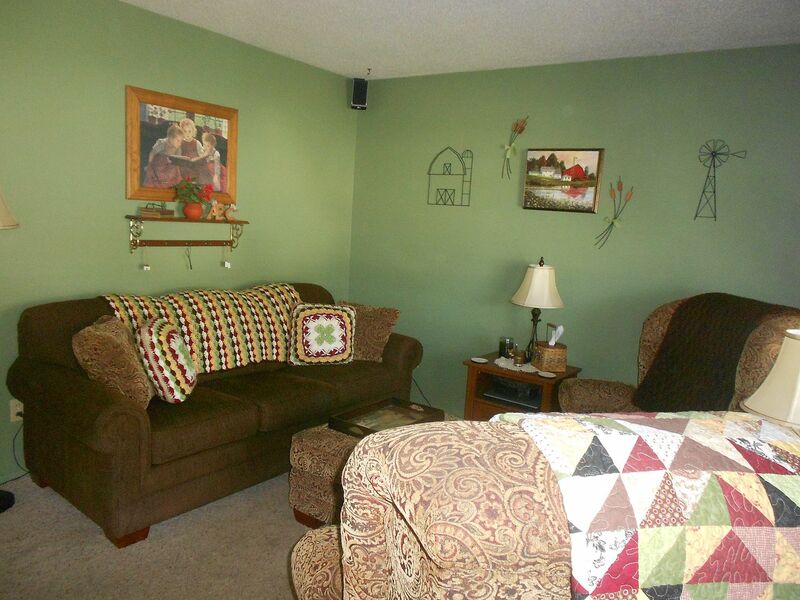 For more insight into their place, here’s the living room. Cute, cozy and comfortable. Can’t wait to visit and see what my sis has been up to at the “old” homestead. 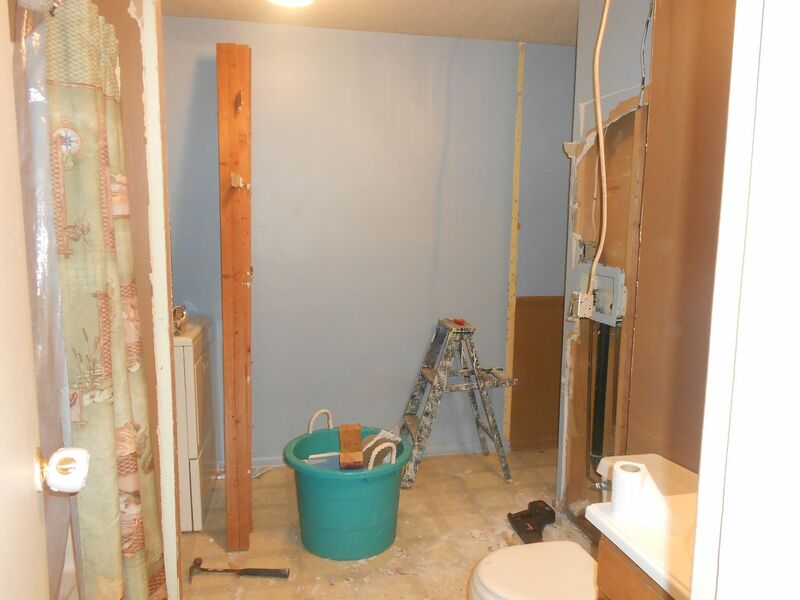 This entry was posted in Bathroom Projects, Before and After, Homes, Kitchen and Mudroom Reno, My Parent's Bath and tagged bath, bathroom, DIY, do it yourself, kitchen, laundry room, makeover, mud room, mudroom, remodel, reno. Bookmark the permalink. Wow. Good job. 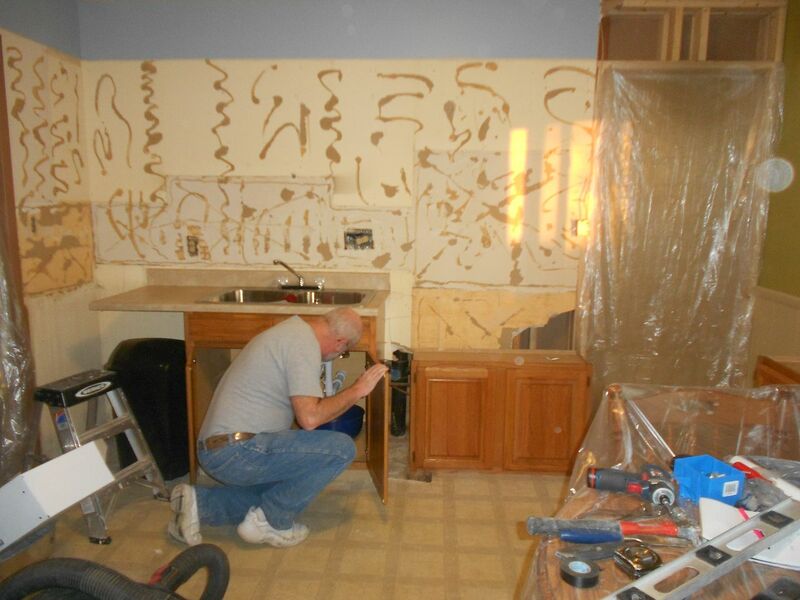 Remodeling the kitchen may be a challenging task, and the aesthetic aspect is only one of the many factors that you need to consider in this project. More than anything, you should think about the functionality and efficiency as you design your new kitchen layout.